Enter Bayou Country with Cajun hospitality and wake up to the aroma of French roasted coffee brewing. 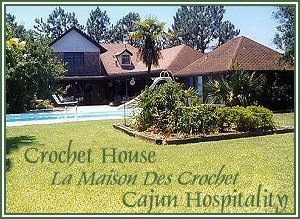 Located in Terrebonne (Good Earth) Parish less than 60 miles from New Orleans, Crochet House is the perfect place to experience the Cajun experience; the people, the culture and their roots. The South Louisiana Bayou is one of the world's largest wetlands and Terrebonne Parish is the land of Mardi Gras, second only to New Orleans. Welcome to authentic Cajun culture where the French language is still alive. Enjoy a blending of people, places, food, music, storytellers and crafters. Welcome to the old time traditions handed down generation after generation and where Cajun English has to be translated. You can still order Jambalaya, Crawfish Pie or File Gumbo at a Cajun restaurant and a visit to Cajun country will be one of the most enjoyable vacations you''ll ever take! Your hosts, Leland and Sally Crochet are lifelong residents of Terrebonne Parish. Both speak Cajun French and they were part of the first generation to speak English in this French speaking community. They have 3 children (1 boy and 2 girls) and 8 grandchildren. Leland enjoys golf, fishing and hunting. Sally loves to cook and paint. Nearly all the paintings in the B&B are done by Sally.